Crested Gecko clinging to a Ginkgo branch. 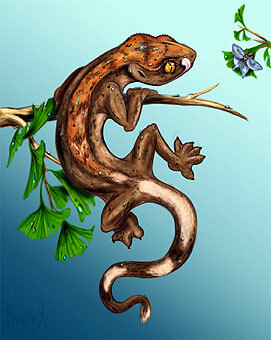 Wikipedia: "The Crested Gecko, New Caledonian Crested Gecko, Guichenot's Giant Gecko or Eyelash Gecko, Rhacodactylus ciliatus, is a species of gecko native to southern New Caledonia. This species was thought extinct until it was rediscovered in 1994. Along with several other Rhacodactylus species, it is being considered for protected status by the Convention on the International Trade in Endangered Species of Wild Flora and Fauna. It is popular in the pet trade." Painting by Phoenix-Cry on deviantART. Enlargement click on picture here. I stumbled upon your blog looking for information about geckos. I saw this blog post and noticed that it wasn't geared specifically toward geckos. But, I found it interesting nonetheless. Thank you.